Have You Tried Kellogg's Latest Snacks? Since January 2013 I've embarked on a healthy lifestyle with my family and I. Specifically, I've done my best to get 1 hour of exercise each and every day, and feed my family nutritious foods (and eat the same myself). In terms of snacking, I allow myself snacks in moderation--and only when the snack has been properly portioned out. As I result, I've lost 70 lbs since January and I'm at a healthy weight and size for myself. You can read about my 10 Simple Strategies to Get Your Family Healthy & Active, which also appeared on The Huffington Post. I discussed some of the factors that caused me to take my health and fitness seriously here. Have you heard about Kellogg's newest snack products from this summer? The Special K Popcorn Chips, shown above, have only 80 calories for 20 crunchy popcorn chips! My kids loved them, and they come in Butter and Sweet & Salty flavours. During family movie time, I portioned out the Popcorn Chips for the kids to enjoy with a veggie plate. Are you looking for a way to increase your fibre-on-the-go? Try All-Bran Blueberry Brown Sugar Flavour Cereal Bars. Each 30g bar is 130 calories and is a high source of fibre. Again my kids enjoyed these bars, and I packed them as a snack during a bike ride. Note: the bars need to be packed sturdily so they do not snap en route! Vector Protein Chewy Bars, in Mixed Nut and Peanut flavours again were inhaled by my kids! Note chocolate lovers: there's chocolate in both flavours! Each bar offers 11g of protein and 5g of fibre. The Vector Protein Bars are energy bars, and are best consumed during periods of intense physical activity. Enter to WIN These Kellogg's FREE Product Coupons from SnyMed.com! Would you like to try the new Kellogg's summer product line? 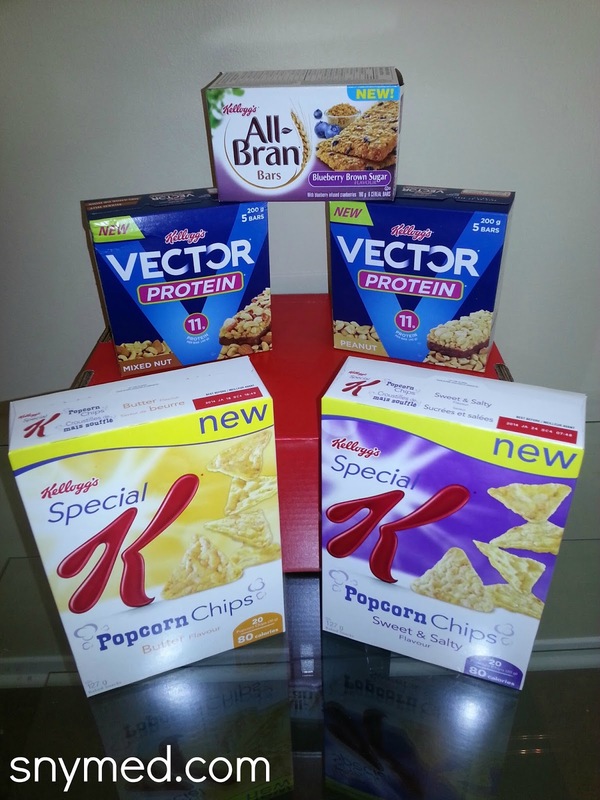 Enter to WIN the 4 products shown above, including 1 box of All-Bran Blueberry Brown Sugar Flavour Cereal Bars, 1 box of Special K Protein Cereal, 1 box of Vector Protein Chewy Bars, and 1 box of Special K Popcorn Chips! 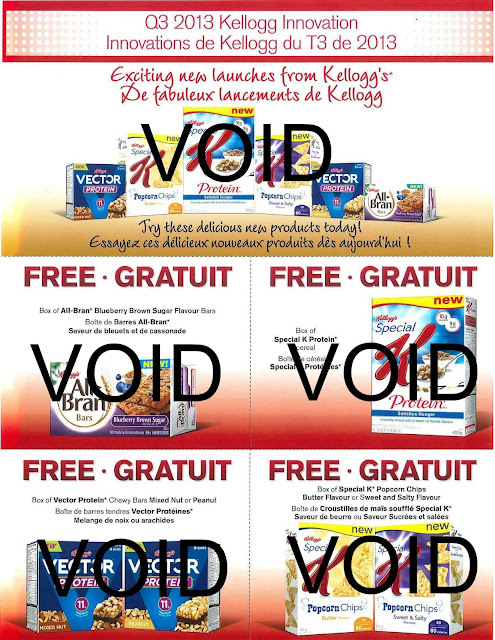 Prize will be a sheet for FREE Kellogg's product coupons, as shown above. Contest open to Canada, and ends September 19th, 2013. Leave a COMMENT below stating which new Kellogg's product that you're the most excited to try. Then, use the entry form below to enter the contest. GOOD LUCK! Disney's Super Buddies Is Now on Blu-ray/DVD Combo Pack! Have your kids seen any of the "Buddies" movies before? The Super Buddies are talking Golden Retriever puppies, each with a unique super power! And even better, each pup gets dressed up in fabulous costumes! There's Rosebud, B-Dawg, Budderball, Buddha and Mudbud. Just like the other movies in the "Buddies" film series, Disney's Super Buddies is a comedy and absolutely family-friendly! The Super Buddies Have Secret Powers! In Super Buddies, the pups unleash their amazing super powers and rush to the rescue when a shape-shifting fiend from outer space threatens Earth. 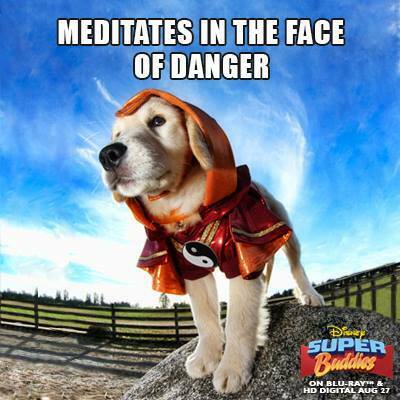 But can the dogs save the planet without revealing their new secret identities? You'll have to get your own copy of Disney's Super Buddies to find out, but let me say that smarts and teamwork always prevail in Disney films! YAY! Super Buddies is now available on Blu-Ray/DVD Combo pack, and can be purchased in stores everywhere! VIDEO: Watch the movie trailer for Super Buddies! 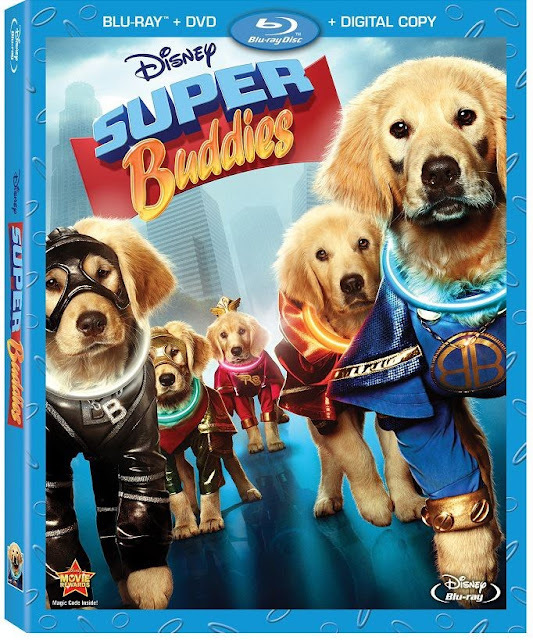 Would you like to WIN the Blu-Ray/DVD Combo Pack of Disney's Super Buddies? I have one copy to giveaway to one lucky SnyMed.com reader! Open to Canada (sorry Quebec), ends Wednesday September 18th, 2013! Leave a COMMENT below stating if your family has ever seen any of the Disney "Buddies" movies before OR if you have a family pet OR you're child's favourite animal. Then, use the entry form below to enter the contest. GOOD LUCK! EPIC Movie Is Now on Blu-Ray & DVD! Have Your Kids Seen It? 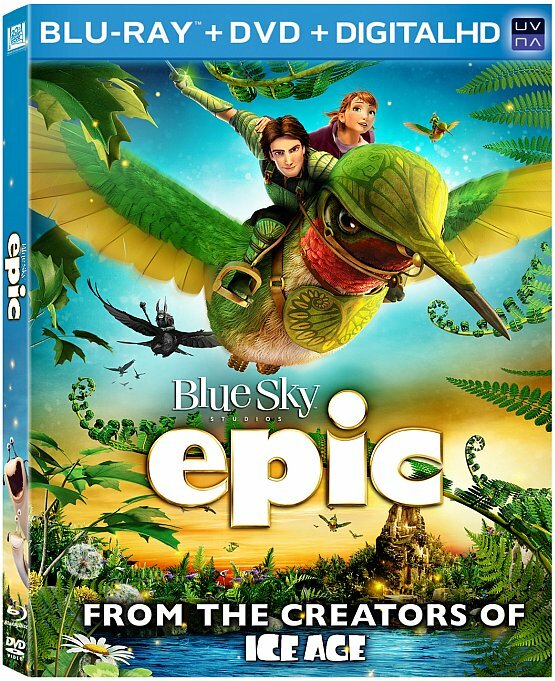 EPIC is on Blu-Ray & DVD Now! I wrote back in May that my family had seen EPIC in movie theatres, and loved it! You can read my full movie review of EPIC here. It's a beautiful family story of a girl, Mary Katherine "M.K", who discovers a miniature world of people, The Leafmen, and charming animals. But this mini world has it's problems, and a battle between good and evil is about to rage on. During this same time, M.K. struggles to build a relationship with her eccentric father, who has spent his life searching for this microscopic civilization. Can M.K. 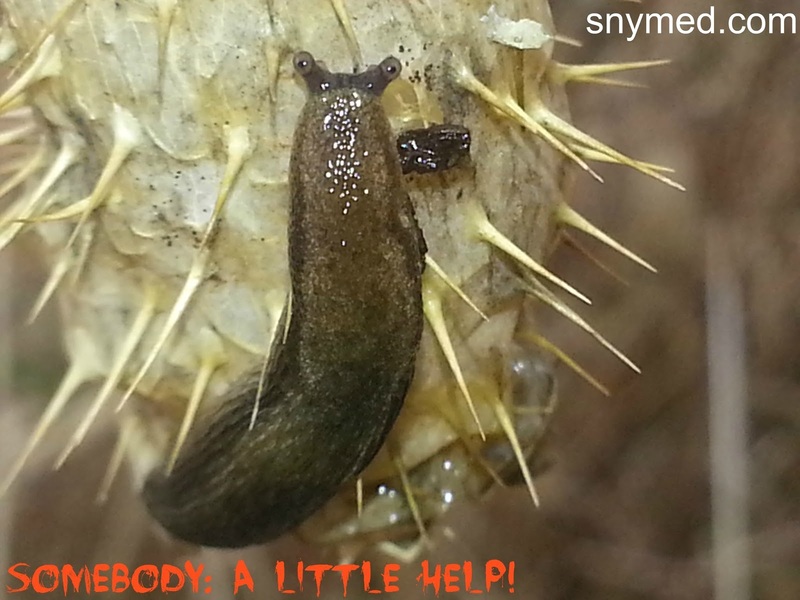 help The Leafmen destroy the Boggans? And can she be a family with her father? If you are looking for a great family movie, check out EPIC, which is now available on Blu-Ray, DVD, and DigitalHD. From Twentieth Century Fox Home Entertainment, and in stores everywhere! What is your child's favourite movie? Has he or she ever seen EPIC before? My Kids Covered in Chocolate, Playing Inside a Giant Box! 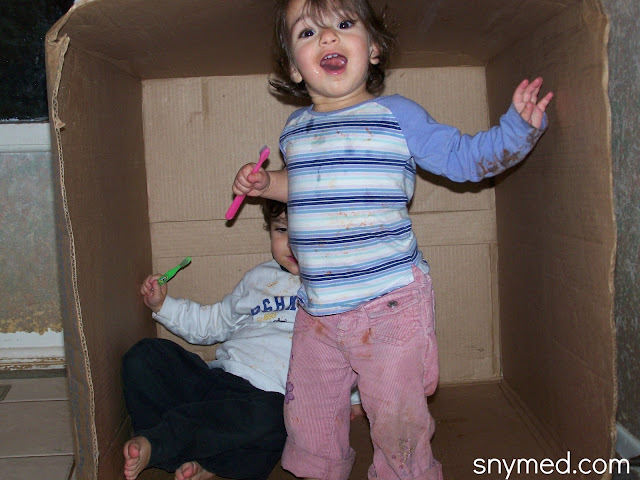 I thought I'd share with you this vintage photo of my kids playing inside an oversized cardboard box, covered in chocolate, while at the same time inexplicably brushing their teeth. I can never remember where the chocolate or the box came from, but the kids look wild and excited! Everytime I look at this photo, I say to myself: "Those kids are filthy!" I have to admit that back when this photo was taken, I did not get the stains out that you see in the photo, and they kind of faded over time wash after wash--but never fully disappeared. My method was really simple: I just washed stained clothing with regular laundry detergent and hoped for the best. Whites I would bleach to get clean, and I would use very badly stained clothing as cleaning rags. Food stains on my kids' clothing was (and is) by far the most common stain that I encountered in day-to-day life. When I really needed to get rid of serious stains, I would either take the clothing to a dry cleaner or check for online help, which was hit-and-miss. So it is with excitement that I tell you about a great new resource for stains, Resolve® Tip Exchange! There you can ask a question about stains, share a tip about stains...and WIN prizes (more below)! In regards to a good stain-treating tip, here's one below regarding Resolve! 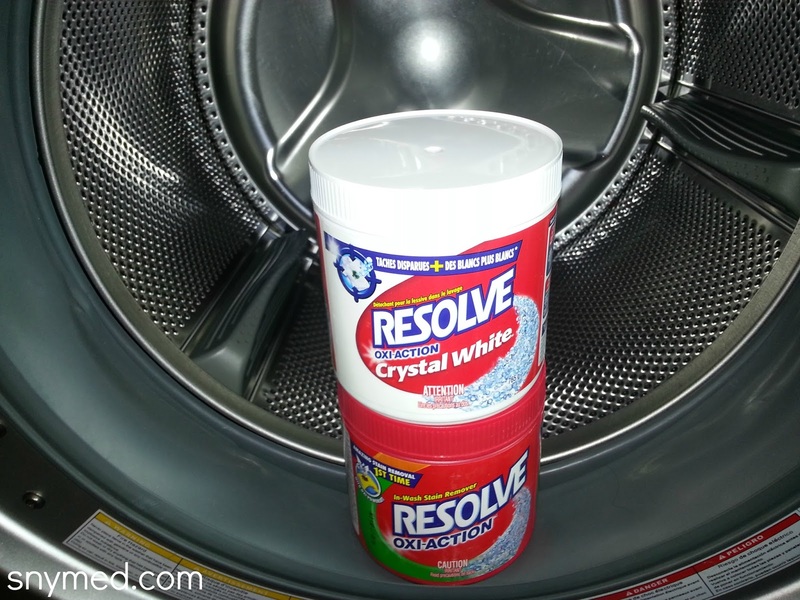 Resolve Treats Tough Stains - Find It At Your Local Store! Fact! You can use Resolve powder to pre-treat especially tough stains, like chocolate, grass, grease and more! Just mix it with some warm water into a paste, and apply it to the stain! To make it even easier, Resolve includes a clever scoop with nobbles on the bottom in order to work it right into the stain. 1. Mix ¼ scoop of Resolve powder with ¾ scoop of warm water (it’s easiest to mix it all up in the scoop). 2. Apply some paste to the stain and leave it for 5 minutes. 3. Use the knobbled scoop to work the paste gently into the stain. 4. Add the stained piece of clothes to the rest of the wash load, add detergent as usual, and simply wash! Share your own stain removing tips on the new Resolve® Tip Exchange website, and you'll be entered for a chance to win 1 of 12 weekly prizes of $250 AND the grand prize of $5000! Woo-hoo, for that amount of money you can hire your own butler to do the laundry for you (joke)! GOOD LUCK! What was the worst stain you ever had to deal with, and were you successful in getting rid of it? 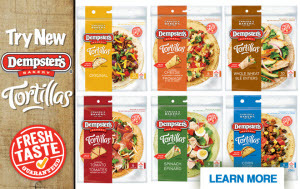 "Wrap Up" Lunch with NEW Dempster's Tortillas & CONTEST (~OVER~)! Lunch Is Easy With Dempster's Tortillas - Ingredients for Crab Salad! This year my husband and I had a rude awakening: we will have to make 4 school lunches, as we'll have 4 kids in school this year! 4 kids in school! And next year, it will be 5 kids in school and 5 lunches to prepare for our hungry crew! If only making lunch were as easy as an assembly line production. 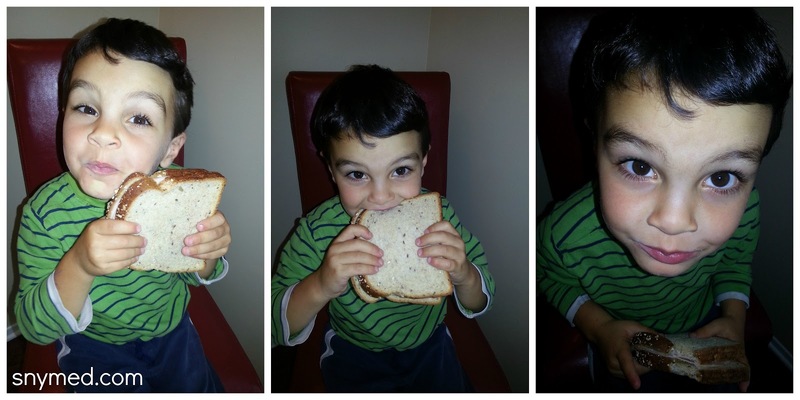 Unfortunately, my oldest son will not always eat traditional bread, my daughter won't eat tomatoes, my second son complains about any "smelly" foods, and luckily my third son will eat whatever you send your way--so watch your fingers! 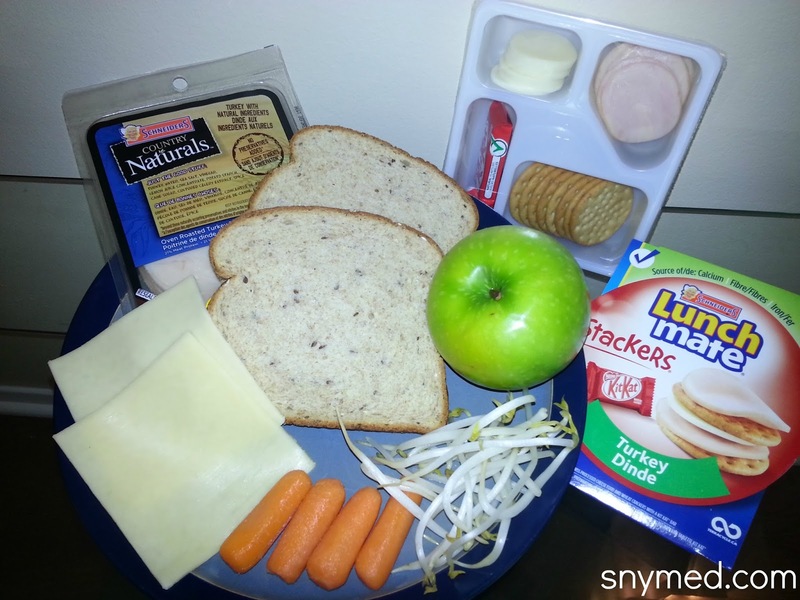 So in the past, the challenge has been to find something that all children will happily eat for lunch. How hard my husband and I have tried in the past to find just one common denominator! However, my kids seem to agree on eating wraps for lunch, even if they don't all agree on how they're topped. As tortilla wraps are a popular lunch choice for my kids, they don't often come home with their lunches uneaten at the end of the day! No one wants a hungry, grumpy kid with low bloodsugar coming home after a long day of school! Everyone knows that kid: grumble, grumble. I think that NEW Dempster's Tortillas are a great idea for my kids' lunches, especially when making wraps! 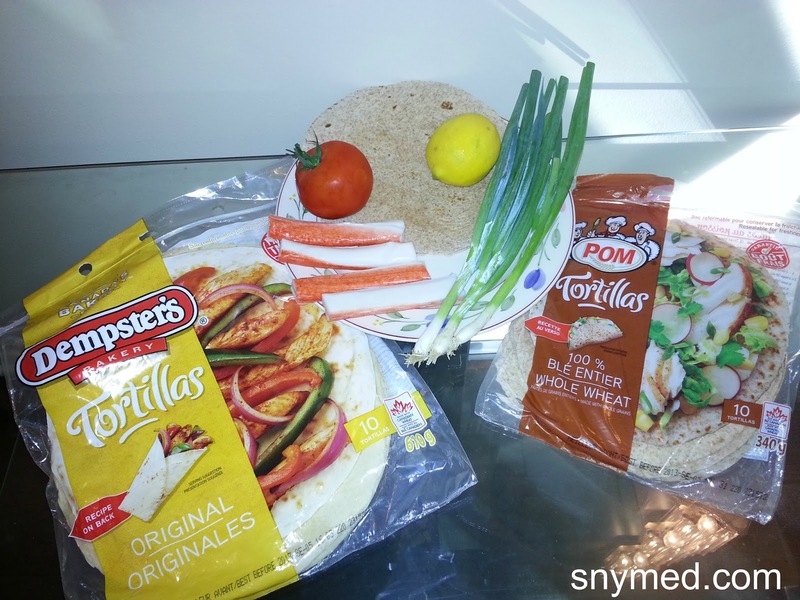 These Crab Salad Wraps Made With Dempster's Tortillas Took Just Minutes to Make! Dempster's Tortillas wraps are simple to make for lunch, and easily roll. And contrary to popular belief, you can put "wet" toppings in a wrap without ruining the tortilla, as long as it's well-drained and you cocoon the sandwich meat or filling around it. There are so many easy Dempster's Tortillas wraps that my kids enjoy finding in their lunchbox: cream cheese with jam, luncheon meat with cheese, scrambled eggs and tomatoes (a breakfast wrap), egg salad with chives, tuna fish with relish, and the list goes on. For lunches that are more perishable, we just put a small cooler pack in with the lunch so that the meal stays fresh. Although my husband and I have to make "custom" lunch orders for the kids, it's not a hard feat with NEW Dempster's Tortillas wraps! The older kids help out by assembling their own wrap, rolling it up, and slicing it in half with a butter knife. 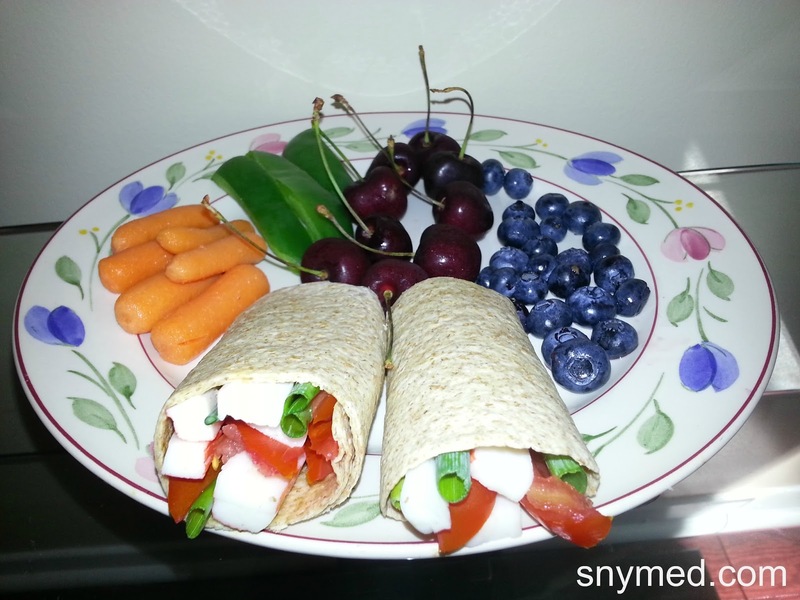 I find that with a wrap the kids fill up less on bread, and it's easy to stuff the wrap with more protein and veggies. My Kids Are Serious About Lunchtime! MY EASY CRAB MEAT WRAP RECIPE! This is my crab meat wrap that you see pictured on this blog. WINNERS: Jonnie H. & Sagarika S.
WIN 1 of 2 prizes of $20 in Dempster's FREE Product Coupons (I'm giving away $40 total in FREE Product Coupons)! 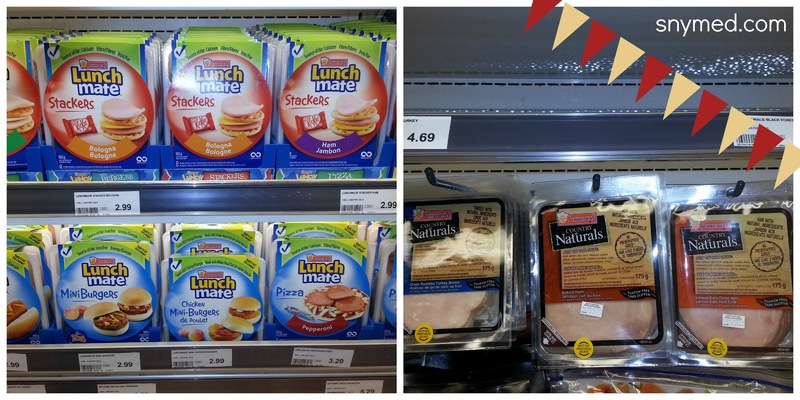 The coupons are good for any Dempster's products your heart desires and can be combined on one purchase! Contest open to Canada, and ends on Friday September 13th, 2013. Leave a COMMENT below stating what you would like to wrap up in your own Dempter's Tortillas! Then, use the entry form below to enter the contest. GOOD LUCK! 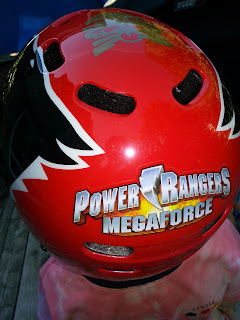 How My Son Built Confidence: Power Rangers Megaforce Scooter & Helmet! My Son Enjoying His Power Rangers Megaforce Scooter & Helmet! I'm proud to be a Saban Brand-Bassador and my kids and I think that the Power Rangers are just great! The Power Rangers values include Standing for What's Right, Teamwork and Cooperation, Confidence, Physical Activity and Healthy Eating, and Caring and Friendship. These are important values for my children to embrace, and ones that my husband and I actively promote in our own household. You can read more about the Power Rangers emPOWER Program here! This summer, my 5-year old has been working on building his Confidence, one of the Power Rangers' values. To help with his confidence, we've encouraged him to learn new skills that he can feel proud of. One of his new skills is learning how to swim, and at each subsequent swimming lesson I see his confidence growing. Even this Monday, my son came home from daycamp and told me that he had--for the very first time--jumped off the diving board (in a lifejacket) and loved it! He was absolutely exhilarated by this experience! Previously my son would have backed away and told himself that he wasn't capable of jumping off the diving board. But the swimming lessons have really helped him challenge his concepts of what he can and cannot do. And now when he goes to the swimming pool next, he will have the self-confidence to do what was once impossible to him. 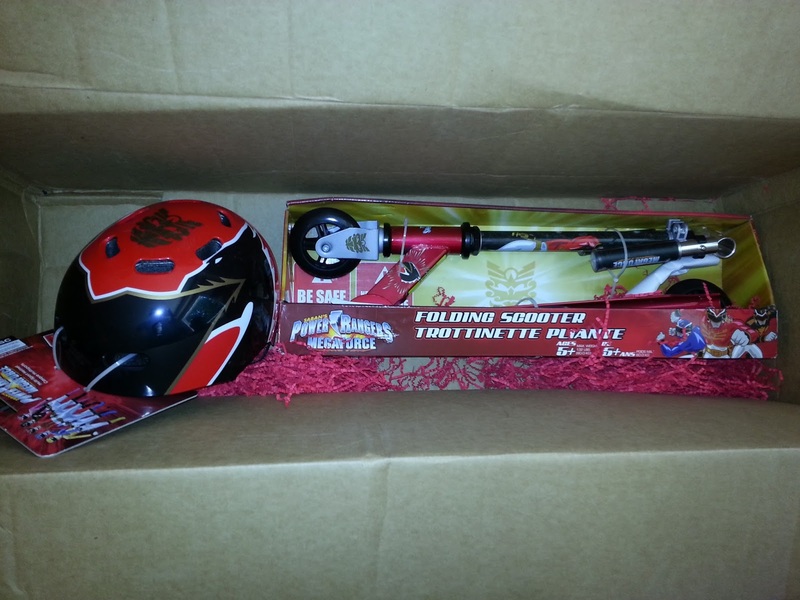 A few days ago a big box arrived from our good friend the Power Rangers. I opened it up, and at once I knew it was meant for my 5-year old son. It was a Power Rangers Megaforce safety helmet and a folding Power Rangers Megaforce Scooter! 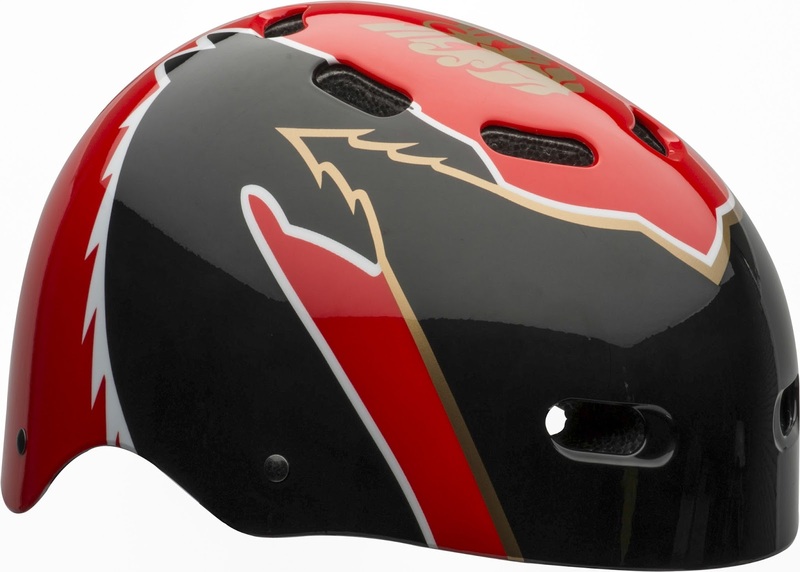 Not only were the items for ages 5+ years, but they were also my son's favourite colours: red and black. 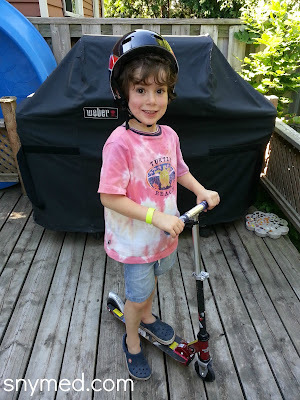 My son was very excited to receive his own scooter and safety helmet, and right away he wanted to try it out. He gave the scooter a try, and right away he said he could not do it when he lost his balance. I could see he was frustrated, and had tears in his eyes. I worked with him gently over the next 15 minutes to show him the basic scooting techniques. 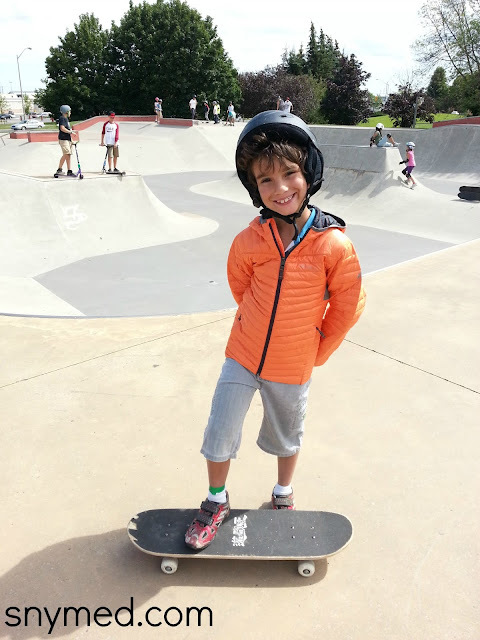 He started to get the hang of it, and there in front of my eyes, I watched my son's confidence grow. He could scoot! He could balance! 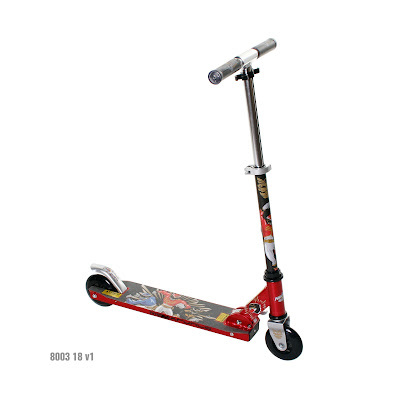 He could scoot and balance on his brand new Power Rangers Megaforce scooter and he was glowing with pride. Check out the VINE video of him below, showing how confident he became on his scooter with just a little bit of practise! The Power Rangers Aluminum Folding Scooter retails at Toys R Us (USA) for $39.99, with the Power Rangers Multi-Sport Helmet priced at $24.99. 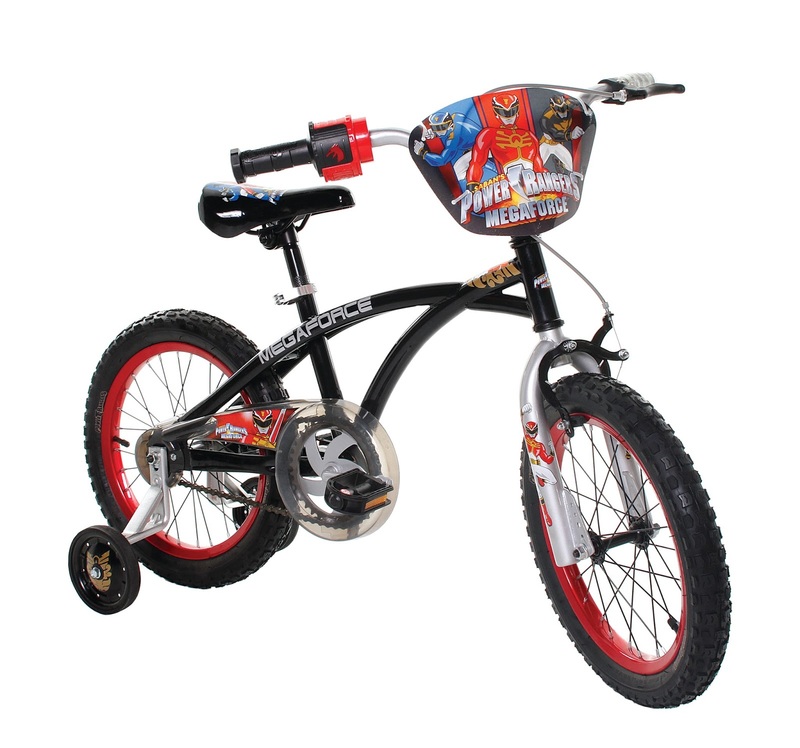 There's also the Power Rangers 16" Bike that an also be purchased at Toys R Us (USA) for $79.99! You can check out the bicycle, below! Power Rangers Megaforce airs on Nickelodeon, Saturdays at 1:00p/12:00c and every day on Nicktoons! Set your PVR so the kids don't miss an episode! Would you like your child to be the next "Ranger of the Week"? Submit a photo and story of your child encompassing the Power Rangers values, such as their leadership in health and fitness, teamwork or friendship at home or at school, or their love of healthy eating. Just upload your photo to the Power Rangers Facebook page, with your child's first name, age and city/state (or Province). If your child is chosen for "Ranger of the Week", he or she could be featured on the emPOWER home page! What helps build your child's confidence? Has your child had to overcome any obstacles in order to feel confident? 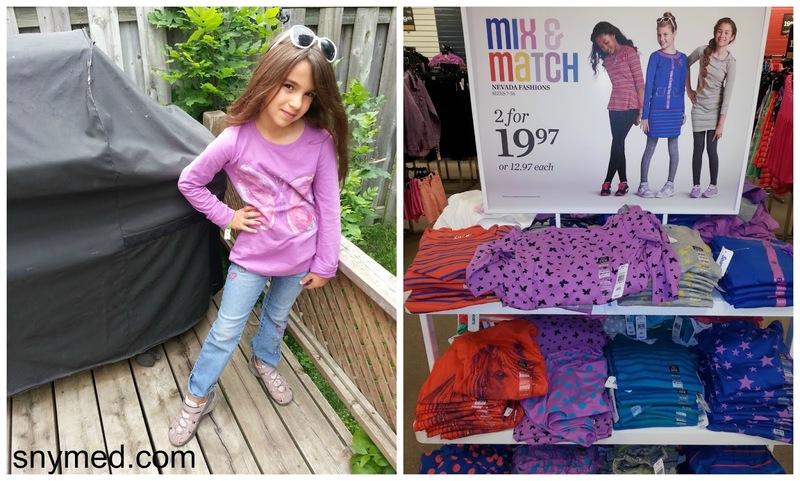 Our Sears Canada Back-to-School Shopping Haul & CONTEST! Back-to-School Shopping Can Add Up with 5 Kids! I wrote about our whirlwind summer recently on The Huffington Post: we bought a house, sold a house, and somehow fit in a family get-away at the cottage. Now as I write surrounded by big cardboard boxes, we are moving in just days. Days! And then it's time to unpack, meet the new neighbours, register the kids at the new school, and start our back-to-school routine. Now, with my house in a state of upheaval, I have to think about back-to-school clothing, backpacks, and school supplies for the kids! With all the kids' clothing boxed and packed away, I did not have the proper chance to take inventory and survey what each child needs. But from memory, two kids need backpacks and lunchbags, a few of the kids need some new school supplies, and all five of my kids need a few back-to-school outfits. This is a tradition in my household: each child gets to pick out a few new outfits every back-to-school season. Girls' Mix & Match Longsleeved Shirts Are 2 for $19.97 at Sears! With the big task of shopping for 5 kids aged 8-years and under, I decided to shop at Sears Canada and see how far $100 would go. My daughter has a lot of bottoms, so I decided to let her pick out 2 new longsleeved shirts for back-to-school. She gladly picked out the purple butterfly shirt you see above, and a second one (not shown). The shirts were 2 for $19.97, or $12.97 each. I'm Sending the Boys Back-to-School in Orange! My oldest son (left) has a lot of clothes already, but I wanted him to have something new to commemorate a new school year. He chose this bright orange longsleeved shirt with navy pocket, which cost $12.97 (price was $19.97 had I purchased 2 similar shirts). 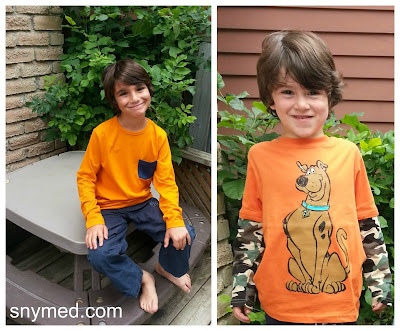 My second son (right) let me pick out this Scooby Doo longsleeved fooler t-shirt, with camouflage sleeves. He loves it! Cost was $9.97 (price was $17.97 had I purchased 2 similar shirts). This son also got a cute pair of navy trackpants for $9.97. 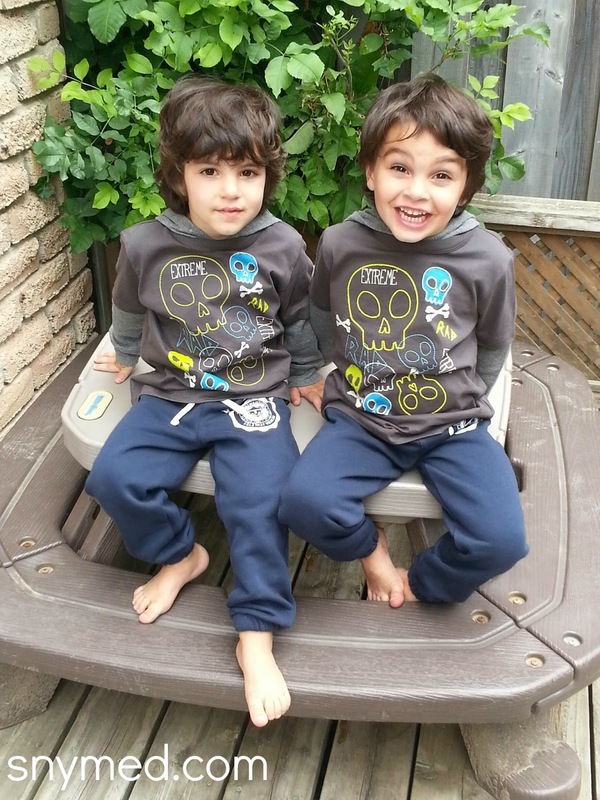 (I purchased the identical pairs for my 2 youngest boys, so the cost was 2 for $14.97). My youngest two boys--or should I call them Ying and Yang--decided they wanted identical outfits. For $12.00 each, I purchased the Osh Kosh longsleeved hoodies with waffleweave sleeves shown above, and the same navy blue trackpants that I purchased for my second son (cost was 2 for $14.97). I like these trackpants so much, I'll be returning to Sears to buy the same in grey! All my kids are delighted with their new back-to-school clothing, and can't wait to wear the outfits this fall! Get All Your Back-to-School Shopping Done at Sears Canada's The Kids Room! 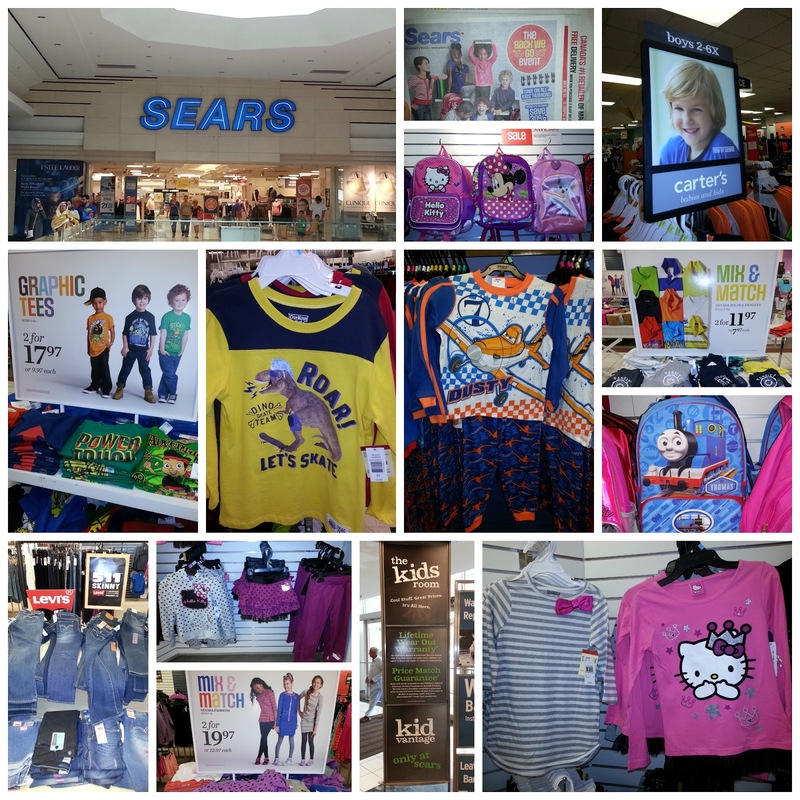 Have you checked out the Sears Canada The Kids Room? I'm glad to say that I shopped The Kids Room at my local Sears, and it was a great experience! 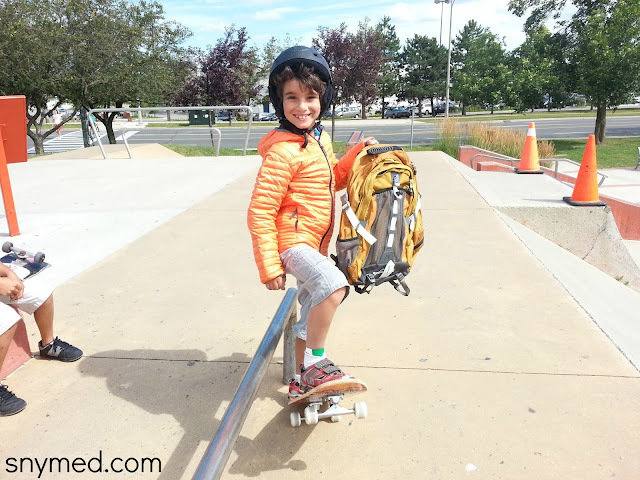 With 5 kids aged 3- to 8-years old, both boys and a girl, it was easy for me to shop for all their back-to-school needs there in one place. Finding the correct sizes, colours and styles were no issue whatsoever. 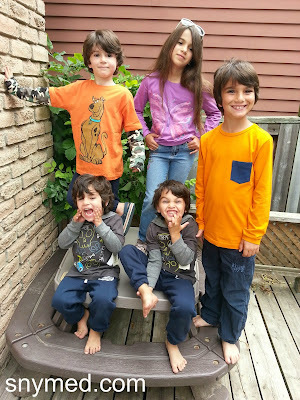 I was also very impressed by the Sears Canada KidVantage lifetime wear out warranty! In a nutshell, this warranty covers kid's apparel and footwear as long as a child in the family continues to wear the size. If the item wears out before this time, you're covered! Sears Canada also features an amazing Price Match Guarantee which matches a competitor's advertised price on identical items within 30 days of purchase, or 90 days if made with a Sears Financial Credit Card. Do You Know About the KidVantage Lifetime Wear Out Warranty? Thinking back to my own childhood, my favourite part of back-to-school shopping was always getting a new metal lunchbox and matching thermos! Times have definitely changed since when I was a child, but I noticed that Sears Canada has got all the characters covered like Disney Princesses, Hello Kitty, Jake and the Never Land Pirates, Disney Planes, Thomas the Tank Engine, Disney Cars, Minnie Mouse, Barbie and more! 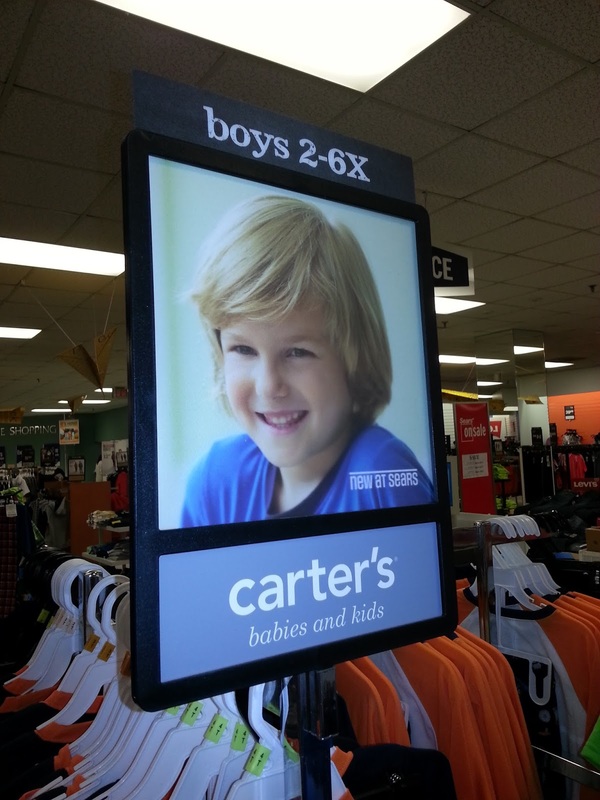 I also took notice of great children's brands at Sears Canada such as Osh Kosh, Levis, Nike, Adidas, and Carter's! And there were great-looking shoes from Converse, Skechers and more! Sears Canada Has Great Brands Like Carter's, Osh Kosh, Levis, and Nike! 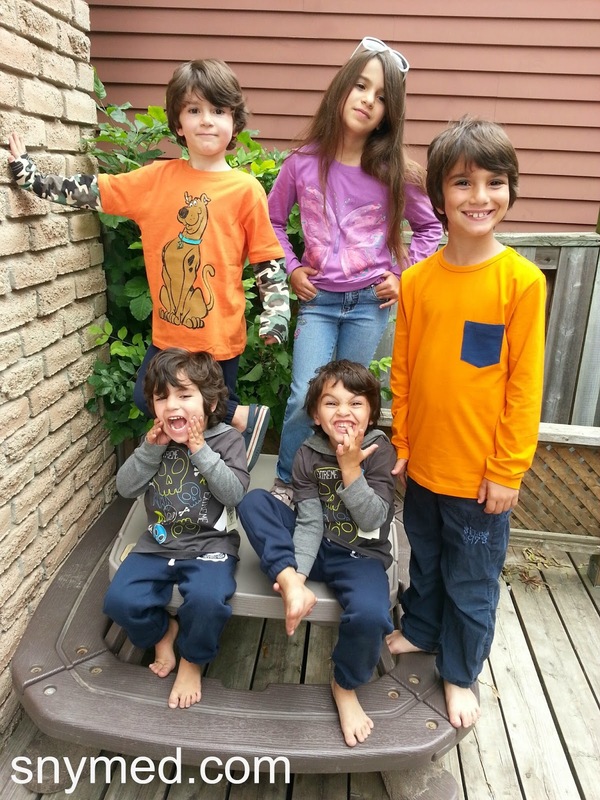 I think I did very well stretching my $100 when shopping for my 5 kids at Sears Canada (with $3.56 to spare)! I admit that all 5 of my kids were running around at The Kids Room at Sears (always a personal challenge), but I got in there fast and got my back-to-school shopping done very quickly! 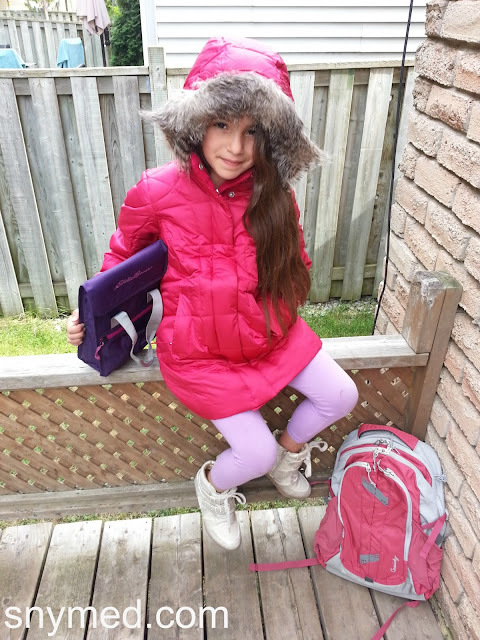 It's the Sears Canada "Back We Go" Facebook contest! WIN 1 of 5 weekly Sears Canada gift cards, and 35 daily $50 Sears Canada gift cards--perfect for back-to-school shopping! To enter the contest, simply "like" the Sears Canada Facebook page and click on the contest tab. 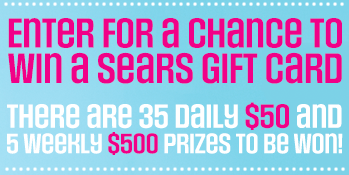 ENTER THE SEARS CANADA CONTEST! Follow Sears Canada on Social Media! Have you done your back-to-school shopping yet? What are the main items on your list to buy? 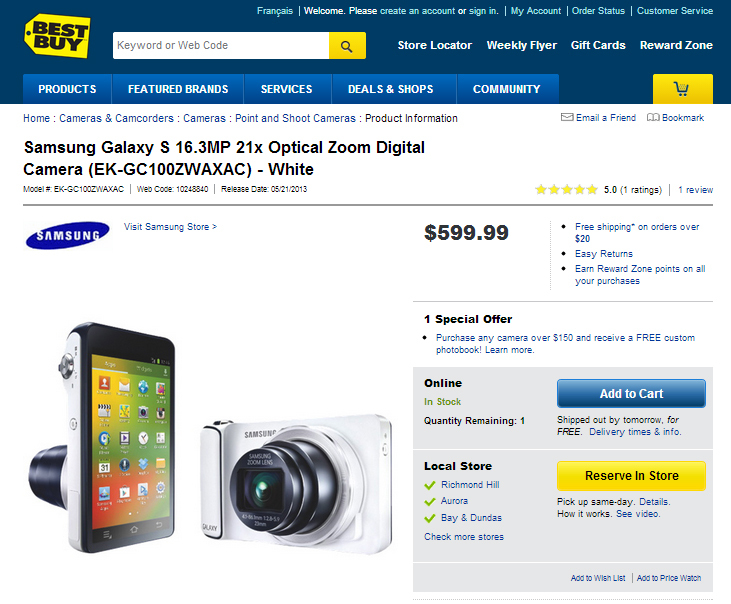 The Samsung Galaxy Camera at Best Buy Canada: Clarity With a 21x Zoom! Could Your Camera Take This Photo From Across a Field? As the owner of the Samsung Galaxy S3 smartphone with built-in camera, I have been very curious about the Samsung Galaxy S 16.3MP 21x Optical Zoom Digital Camera (model # EK-GC100ZWAXAC). I love my 1-year old Samsung Galaxy S3 and find that it takes extraordinary photos for a smartphone. In fact, all of the photos on this blog have been taken with my Samsung Galaxy S3 phone. Recently I have been weighing whether I should upgrade my phone to the Samsung Galaxy S4 phone, or purchase a hand-held camera. I have really wanted to take more shots from a distance, but my camera phone does have it's limitations. It always seems that I'm trying to take photos of the kids at sporting events, but my photos degrade with distance. That's why I decided to look into the Samsung Galaxy S 16.3MP 21x Optical Zoom Digital Camera. Simply stated, I wanted a camera with greater zoom, better clarity and ability to share my photos on social media. 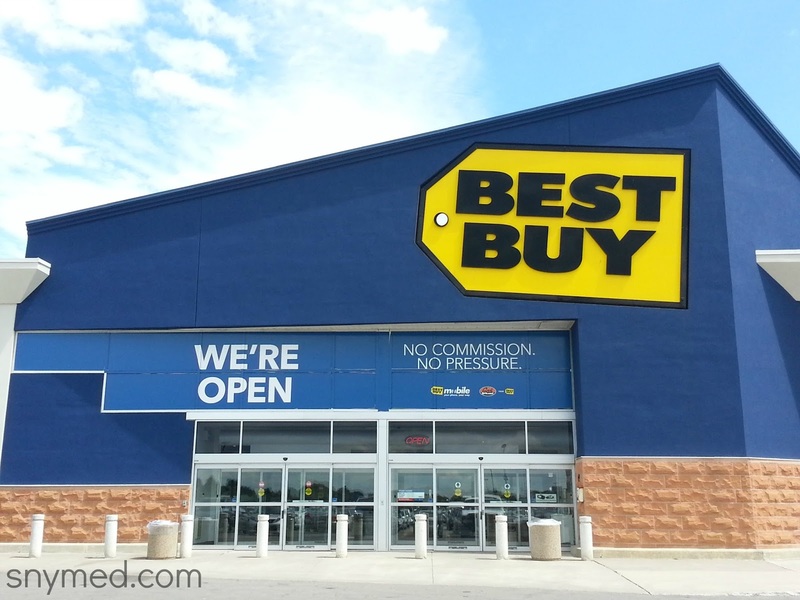 Starting my research online, I typed in the camera name and the Best Buy store was one of the first to pop up. Clicking through, I noticed the Samsung Galaxy Camera features the same menu that I have (and enjoy) on my Samsung Galaxy S3 phone. This was a bonus for me, as I love the Galaxy S3 menu, and find that it's very easy to use! 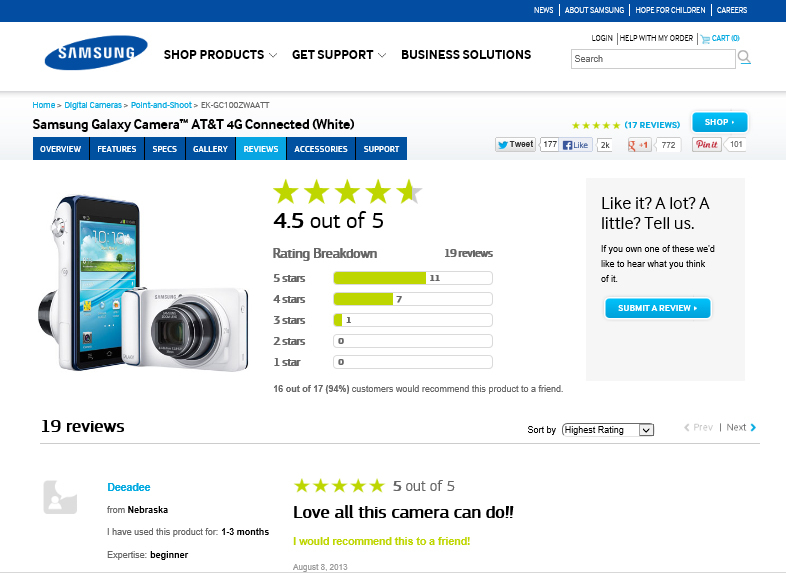 Next, I looked for reviews on the Samsung Galaxy Camera (model #EK-GC100). 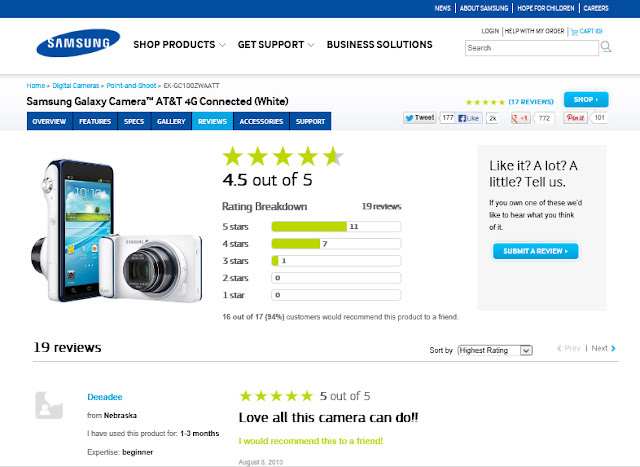 Right away it pulled up a 4.5/5 star review on the Samsung website, so I read all of the 17 reviews. The reviewers had great things to say about the camera, such as it was lightweight, simple to use, took beautiful photos, and that it easily integrated with social media. Perfect! Exactly what I look for as a mother, blogger, and (amateur) photographer! The biggest downside listed about the camera was the pricepoint (it's $599.99). This point did not concern me, as the other cameras I was looking at were at about the same pricepoint. I wondered how far I could zoom in with the Samsung Galaxy Camera without having it lose its clarity? Would a 21x zoom meant that I could take photos of my kids from across my backyard--or from across an entire sports field? To answer my own question, I decided to go into my local Best Buy to try out the Samsung Galaxy camera. I also wanted to check out the competition, and see the similar cameras that were available for purchase. I was already heading to the mall to do some back-to-school shopping with the kids over the weekend, so I decided to check out the camera during the same trip. I decided to let daddy tend to the kids, so I could properly shop the cameras at Best Buy Canada. It was important to me to be able to shop uninterrupted and facilitate a proper comparison between the Samsung Galaxy Camera and its competition. 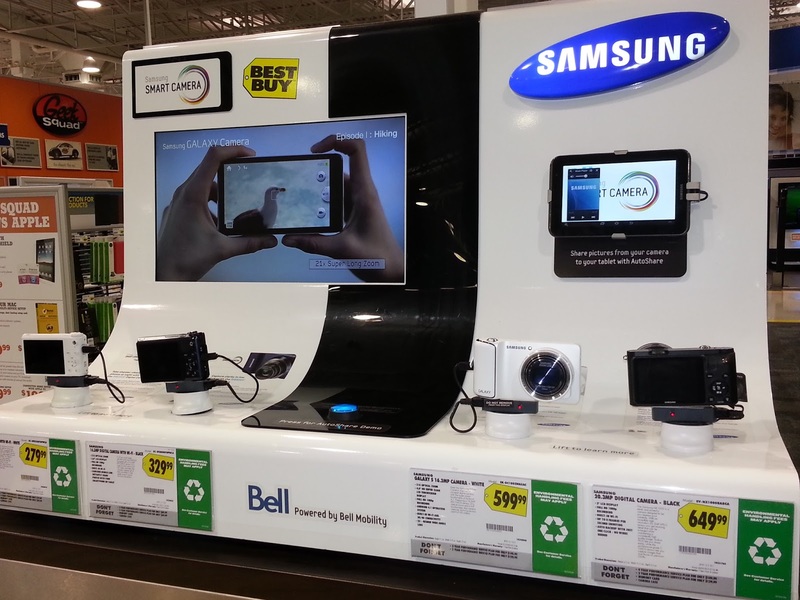 The Samsung Galaxy Camera was powered on and ready to test at Best Buy Canada. I noticed with pleasure that the Samsung interactive display had a "help" button to call over an associate had I had any questions. There were plenty of staff on hand in the camera section, so I never needed to push the button. 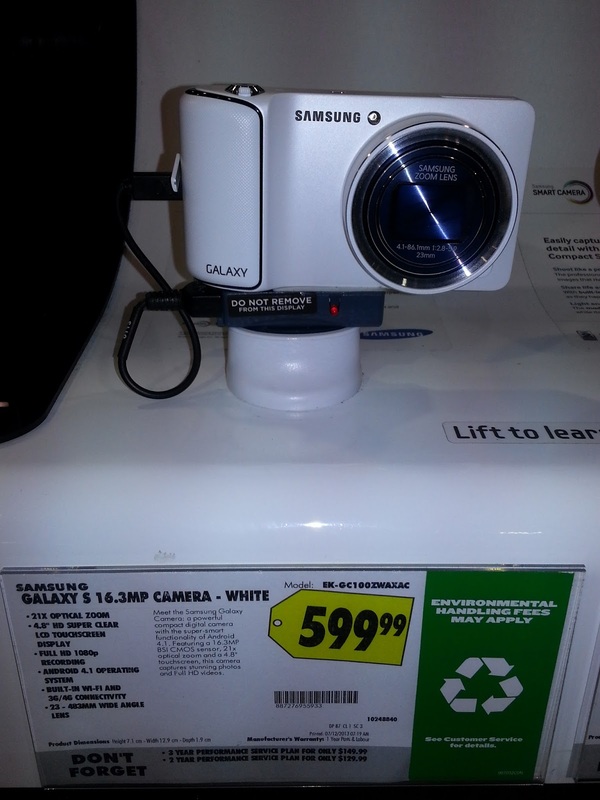 Looking at the Samsung Galaxy Camera, it was priced the same as its online price ($599.99). This is the kind of consistency that I appreciate! I compared the product specifications to the online specifications, and I confirmed that this was the same model I wanted to test out. This comparison is very important to do, as "camera alley" has many identical makes, but different model numbers! 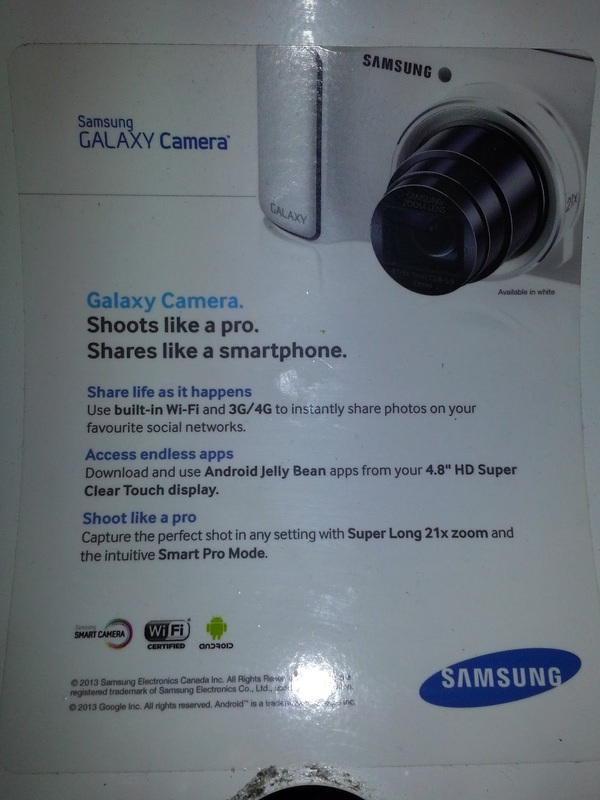 The Samsung Galaxy Camera's Menu Is Almost Identical to the Samsung Galaxy S3 Phone! Once I powered on the Samsung Galaxy Camera, I noticed what was one of my initial observations when viewing it online: the camera featured almost the identical menu as my Samsung Galaxy S3 phone! To me, not only was there no learning curve with this menu, but it was extremely easy to use. Just as my S3 phone, the screen was also a touch-screen interface. The screen of the Samsung Galaxy Camera was massive and measured a whopping 4.8" wide! 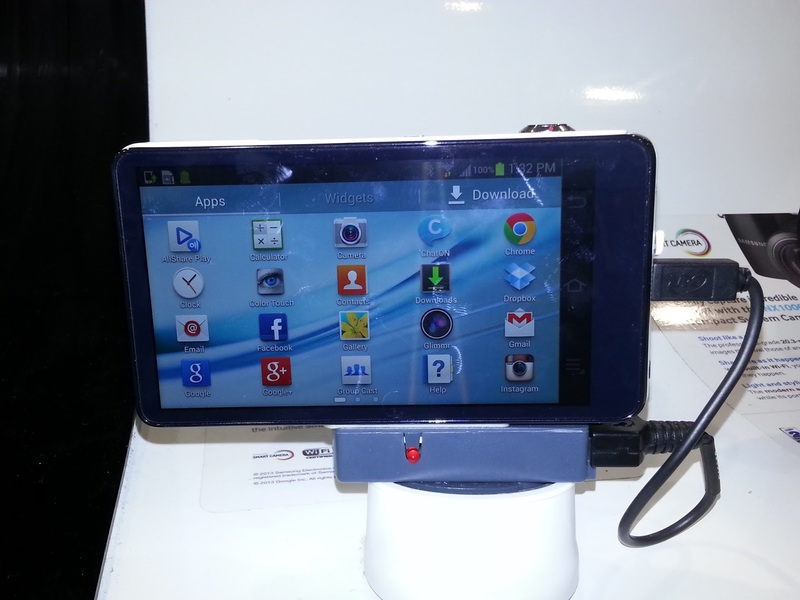 Samsung Galaxy Camera Is GREAT For Sharing on Social Media! Just like my Samsung Galaxy S3 smartphone, its camera counterpart has amazing Social Media sharing features. With it's Wi-Fi and 3G/4G, I could share photos instantly via Facebook, Twitter, Instagram and Google +. In addition, I could e-mail photos effortlessly via Gmail or other e-mail service. I was very impressed with all these social sharing options on the Samsung Galaxy Camera! How Much Zoom? 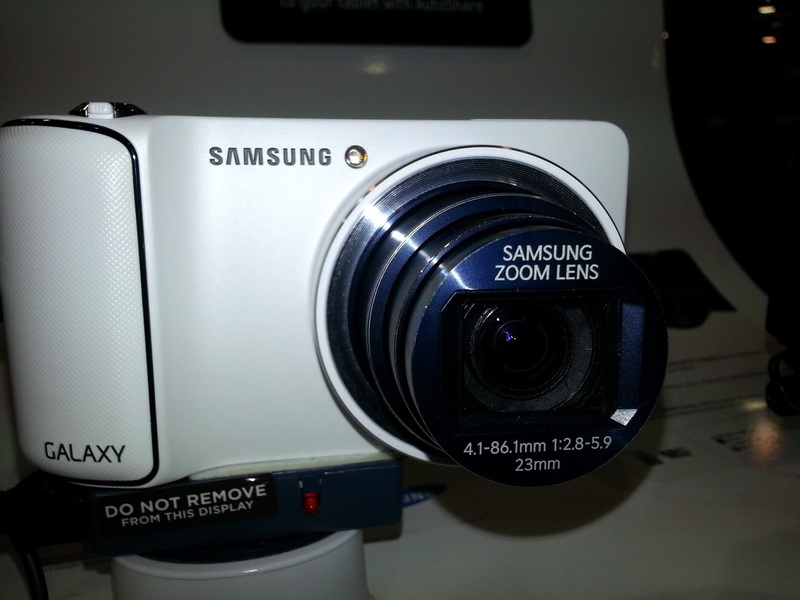 The Samsung Galaxy Camera Features 21x Optical Zoom! Next, I was dazzled by the Samsung Galaxy Camera's 21x optical zoom! I had wondered how far really I could snap clear photos with the camera's zoom? My question was quickly answered when I was able to take clear photos of a pricetag all the way across the Best Buy Canada store! My at-home application for this feature would be taking photos of my kids at sporting or school concert events, without having to get really up close! I headed over to camera alley to check out which camera would be comparable to the 16.3 megapixel, 21x optical zoom of the Samsung Galaxy Camera. At $599.99, the Nikon J3 was priced the same, although the Nikon had less megapixels at 14.2 MP. The Nikon J3 also had a much smaller display screen (3" as opposed to Samsung's massive 4.8" touchscreen). The J3 did have a greater zoom capacity, but had no option whatsoever to share photos on Social Media. Although the Nikon D5100 DSLR was priced at $499.99, it's important to note that it did NOT include the camera lens (cost was $530.00 with lens). Both the Nikon D5100 and Samsung Galaxy had similar megapixels (Samsung's 16.3 MP vs. Nikon's 16.2 MP). Once again, the Nikon had a much smaller display than the Samsung, and offered no option for Social Media sharing. 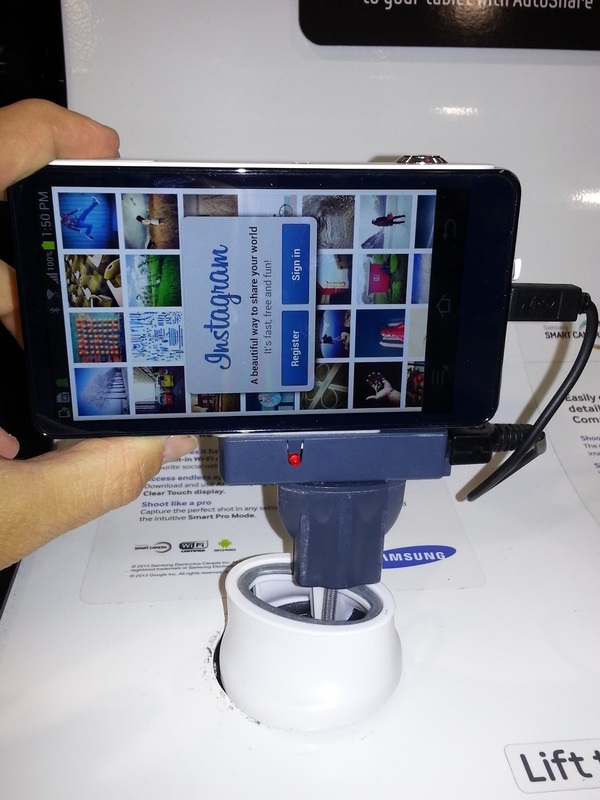 The Samsung Galaxy Camera Is THE Choice For Social Media Sharing! 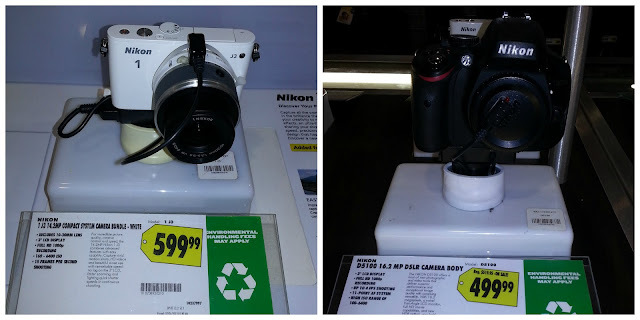 After reviewing the Camera selections at Best Buy Canada, I believe that the Samsung Galaxy Camera is a great choice for the photographer looking for a competive price, reasonable amount of megapixels (16.3MP), and a very decent optical zoom (21x). HOWEVER, no other cameras that I critiqued in the $599.99 or less pricerange--except for the Samsung Galaxy Camera--allowed direct Social Media Sharing via the actual camera. The Samsung Galaxy Camera was unique with its Wi-Fi and 3G/4G capabilities. Therefore, I would recommend the Samsung Galaxy Camera as THE Choice for Social Media photosharing. See my Google+ Album for More Photos of my Samsung Galaxy Camera Shop at Best Buy Canada! What camera are you currently using? What's on your wishlist when it comes to a camera: social media sharing, more zoom, more clarity, or other? 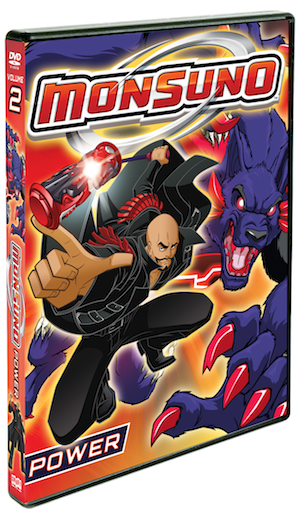 Monsuno: Power Is Out On DVD! My kids are crazy about the Pokemon series, which is why I was curious about Monsuno: Power. Monsuno is a show along the lines of Pokemon, though several shades darker, more destructive and for a slightly older child. The similarities between Pokemon and Monsuno are that both are a Japanese series, both shows prominently feature non-earth creatures as the premise for the show, and both shows have the creatures battle against each other by releasing them from a small vessel that's thrown. "Monsuno is an epic boys action adventure series where kids discover, command and battle creatures with tremendous destructive potential." Monsuno: Power is the second volume in a DVD collection based on the popular Nicktoons animated series, and includes 5 action-packed episodes. Monsuno: Destiny is the first part of this DVD collection, which was released early this year. You can purchase a copy of Monsuno: Power for around $14.97. During his search for his lost father, young Chase Suno has been given a great gift: a powerful Monsuno creature named Lock who is the ultimate protector! Joining forces with his friends Jinja and Bren, Chase must protect the Earth from destruction, as he takes on his most powerful rivals and their own Monsunos! Has your child ever watched the Monsuno series, or does this sound like something that he or she would enjoy? What's your child's favourite cartoon right now? 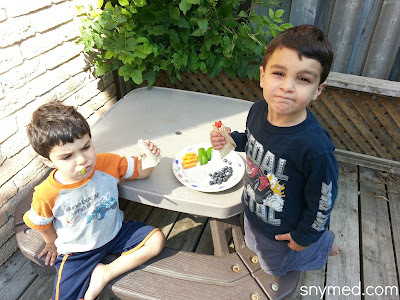 Disney Junior Canada Dream Cruise CONTEST & Awesome August Programming! WIN a Magical Disney Dream Cruise from Disney Junior Canada, This August 2013! When I first learned that Disney Junior was giving away a Dream Cruise this August, the first thing I said was "WOW! One amazingly lucky family will WIN the trip of a lifetime!!!" And then it hit me, the Disney Cruise Line cruise is worth $12,000...12,000 DOLLARS! That's life-changing! My husband and I have never been on a cruise before, although we have certainly dreamed of taking the kids on a Disney Cruise one day. In December 2012, we took the kids to Walt DisneyWorld in Orlando, Florida, which was a good first step for our family. There, all the kids' favourite characters came to life, and the rides, parades, movies, shows and the theme park were like being inside a Disney movie! Our Walt Disney World trip was a trip of a lifetime, so I can only imagine how fantastic WINNING a Disney Dream Cruise from Disney Junior Canada would be! It would be Magical! To be all together as a family on vacation--on a cruise ship out to sea! To visit exotic destinations, enjoy the onboard shows, buffets and activities--to hug Mickey Mouse and Minnie--and splash down a gigantic waterslide! Now THAT would be living! Just imagining this scenario makes me dizzy with excitement! You can WIN a Disney Dream Cruise from Disney Junior Canada this August, and get to choose between 1 of 3 different cruises for a family of 4! This fantastic prize includes airfare from a major Canadian gateway airport closest to the winner's residence in Canada--to the American airport closest to where the cruise ship will depart! Oh, and I should mention that cruises #1 and #2 below also include FOUR 1-day Magic Your Way Tickets with Park Hopper Option, and ONE Disney Gift Card in the amount of six hundred U.S. dollars ($600)! What an amazing contest from Disney Junior! GOOD LUCK everyone! WIN a Disney Dream Cruise (3 Choices)! 1. Seven-night Eastern Caribbean or Western Caribbean Disney Fantasy Cruise Package! 2. Four-night Eastern Caribbean or Western Caribbean Disney Dream Cruise Package! 3. Five-night Western Caribbean on Disney Magic or Disney Wonder Cruise Package! Enter to WIN a Disney Dream Cruise from Disney Junior Canada, each day until August 30th! BONUS ENTRIES: Receive up to 15 bonus entries by watching Disney Junior Canada every Saturday in August from 6:00-7:00pm EST. Each Saturday during this timeframe the Disney Junior Canada channel will have a different Magic Word worth 5 bonus entries each. Click here for the contest Rules & Regulations! GOOD LUCK! ENTER to WIN a Disney Dream Cruise from Disney Junior HERE! But there's even MORE from Disney Junior Canada this month of August! Weekdays in the Summer from 6:30-7:30PM EST! Sofia the First & Jake and the Never Land Pirates, Weekdays 6:30-7:30pm EST (During Summer)! - All summer long, Jake and the Never Land Pirates and Sofia the First will be featured from 6:30-7:30pm EST! In addition, a BRAND NEW episode from one of the series will premiere each and every Monday of the summer during the same timeslot! So grab your tiara or pirate sword and get ready for some big summer fun! My kids get really immersed in the shows, especially when they dress up as their favourite princess and pirate characters! Dressing up while watching Disney Junior really marries two things that they enjoy the most! Look at how much fun they're having! Check out these Funtastic Princess and Pirate Activities from Disney Junior Canada! 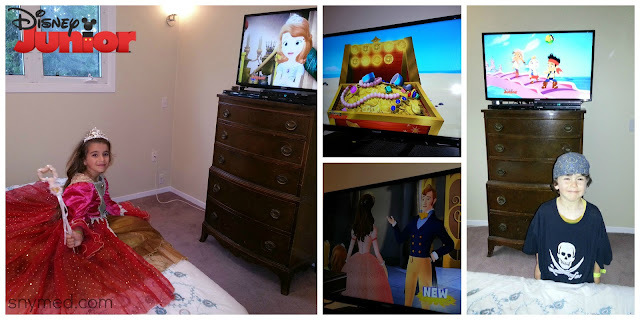 Sofia the First & Jake and the Never Land Pirates GAMES! Sofia the First & Jake and the Never Land Pirates COLOURING & CREATE Activities! TOY STORY 2 PREMIERE - Saturday August 10th, 2013 @ 6:00pm EST! - My kids are SUPER excited for the Toy Story 2 premiere on Saturday August 10th, 2013 at 6:00pm Eastern Standard Time! Woody is accidentally put out in a garage sale and is stolen by the owner of Al's Toy Barn. With the help of his friends--both old and new--can he make it back home to Andy? You'll have to tune in on Saturday August 10th, 2013 at 6:00PM EST to find out! YEE-HAA! We think that cowgirl Jessie and sidekick Bullseye are such fun and fantastic characters, and of course Woody and Buzz are old favourites. Toy Story 2 is such a wonderful children's movie from Disney-Pixar, so don't forget to set your PVR! On the night of the Toy Story 2 premiere, we're going to make the movie screening into a real family affair and all watch together! The boys can put on their Sherrif Woody pajamas, my daughter can wear a bandana and sherrif star to dress up her pjs, Dad can wear his cowboy hat, and I will wear my plaid shirt, bandana scarf and denim shirt! We can all snuggle together on the big couch in the basement and enjoy some healthy snacks like celery stalks stuffed with cheese slices, carrots with humus dip, and sliced up red apples! BONUS CODE: Don't forget to watch for the Magic Word that will appear during Toy Story 2, between 6:00-7:00PM EST! It will give you 5 bonus entries for the Disney Junior Canada Dream Cruise Contest! Are you planning on entering the Disney Dream Cruise contest? Have you ever watched the Toy Story 2 movie before?